A growing number of U.S.-based retail and restaurant chains do business in Australia, and some of the most popular American retail chains have also become some of the most popular chains "down under." Aussies are buying American brands at U.S. retail stores in large cities such as Sydney, Melbourne, and Brisbane. American retail brands like Apple, Levi's, and ​McDonald's are finding favor with Aussie consumers, and it doesn't look like the U.S. retail invasion is going to stop anytime soon. Australia has often been overlooked by international retailers because of its comparatively small population—nearly 25 million in 2018 compared with more than 326 million in the United States. The country is also relatively geographically isolated with a lack of city centers offering a critical mass of consumers. However, since the Great Recession, Australia has become a more popular destination for U.S. and global retail chains, particularly those seeking to escape a flagging economy and overcrowded, competitive retail marketplaces in their own countries. What Are the Benefits for U.S. Companies? One big advantage for U.S. retailers doing business in Australia is that there is typically no significant cultural backlash. Australians are not too disconcerted when American brands and retailers move into town (except when it comes to coffee chains such as Starbucks). Australians already partake of a steady diet of American entertainment with American music, TV, and movies. Shopping in some of the largest U.S.-based retail chains seems like a natural and logical extension of the already pervasive American influence. When it comes to fast food, the United States is dominating the Australian market with six out of 10 of the most popular fast food franchises in 2017 hailing from U.S.-originating companies, according to Business Chief. Pizza Hut was ranked seventh with over 270 branches in Australia. Hungry Jacks was ranked fifth. As a franchise of the international Burger King Corporation, Hungry Jacks operated in Australia since 1971 when it opened its first store in Perth. As of 2017, it had 390 outlets, and the brand was operating as an independent business, not under the Burger King umbrella. Domino's Pizza was ranked fourth with 600 locations. Domino’s is the largest pizza chain in Australia. Ranked third was KFC, which opened its first Australian location in 1968 in Sydney. It now as 612 stores in the country. 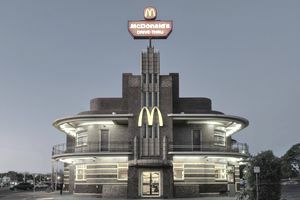 In second place was McDonald’s with over 900 stores in Australia. The first location was in Sydney in 1971. The chain is affectionately known as Macca’s. Subway was ranked the most popular fast food restaurant in Australia in 2017. The first Subway opened in 1988 in Perth and, largely because of its focus on healthy ingredients, it now has over 1,413 outlets down under. What follows is a list of some of the largest U.S.-based retail chains and restaurant chains that are doing business within Australian borders. This list is arranged alphabetically by chain name and not by any type of ranking.